A cutaway view of the design concept for Smallman Street in the heart of the Strip District. Rendering courtesy of the Pittsburgh Department of City Planning. Like a clean rider in the Tour de France, the Strip District bikes lanes along Smallman Street are making slow but significant progress. 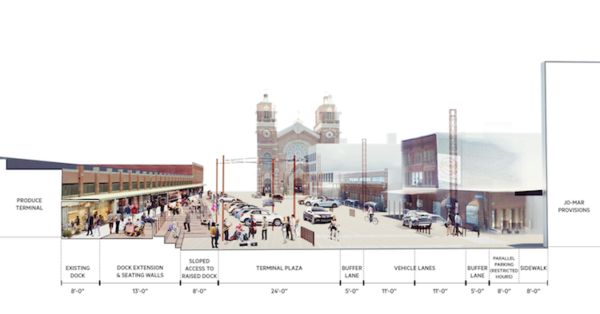 On Wednesday evening, the City of Pittsburgh Department of Mobility & Infrastructure released preliminary designs for parking, bike lanes and pedestrian pathways along Smallman Street in the Strip District. The resurfacing of Smallman Street from 16th to 21st is a project of the City of Pittsburgh Department of Mobility & Infrastructure (DOMI). Their goal? To improve pedestrian access to the Urban Redevelopment Authority (URA) and McCaffery Interests‘ ongoing restoration of the Produce Terminal Building. But early drafts of the project, unveiled at a community meeting last August, drew criticism from the city’s cycling community for including more car parking options but lacking bike lanes. Under the new design, the bike lanes will extend from 16th to 21st, ending at a proposed public plaza. Presenting the new plan to Strip District stakeholders at the AC Hotel last night, DOMI Director Karina Ricks said the project leaders had incorporated public feedback from previous community meetings in drafting these designs. If all goes according to plan, the city will have an open bidding process for the final design and construction this summer, with a winner chosen sometime in August. Construction will take place from September to December of this year. 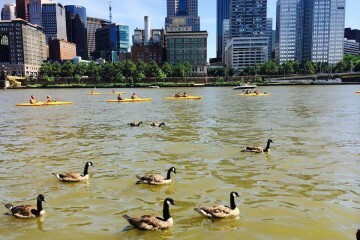 BikePGH Advocacy Director Eric Boerer said that while his organization is pleased that the Penn Avenue lanes are being extended, better connectivity between the East End and Downtown Pittsburgh is still a critical transit need for the city. As Boerer points out, the need will only become more pressing in the next five years as the population in these neighborhoods grows. With both the Strip District and Lawrenceville seeing a boom in the construction of new offices and residential projects, a lack of convenient commuting options could leave both neighborhoods clogged with car traffic. “We want to make biking, walking and transit as easy as driving,” he said. Ricks heartily agreed and said that in addition to the Smallman Street project, her department was embarking on a wide range of projects that would connect cyclists to the entire city.